One of my dearest friends, Dee, gave birth to a baby boy in December. This baby was very much wished for, for a long time. Dee and I went through similar journeys to bring our sons into this world. Over the course of trying to conceive our sons we shared long talks over glasses of wine with tears streaming down our cheeks. We shared text messages of hope, fear, anguish, excitement and then pure bliss as we looked into the eyes of our baby boys. Dee and I both feel incredible connections to our own sons as well as each other’s boys. That’s why when I was invited to a baby shower to celebrate the birth of Dee’s baby boy this past weekend I knew that I wanted to make him an extra special handmade gift in addition to a book for his library. 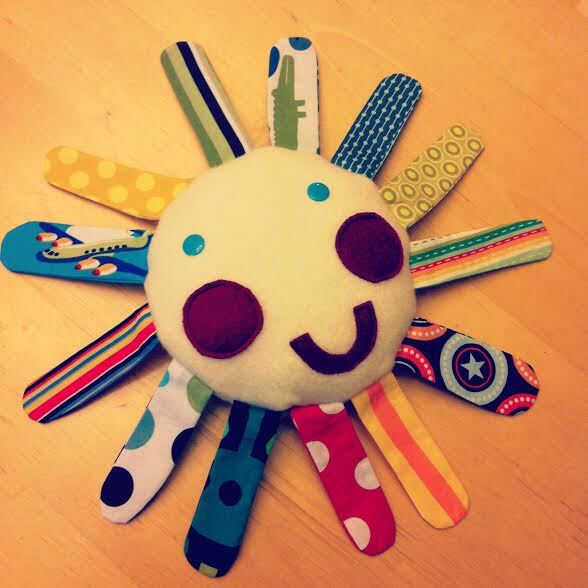 I decided to make Dee’s baby boy a Mr. Sun teething toy, because I know how much this little boy has brightened his mama’s life (along with the life of his Daddy and big sister!) 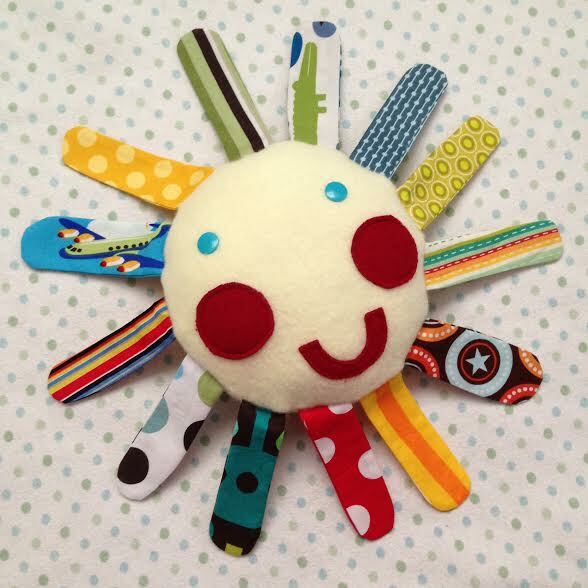 I thought that Mr. Sun made such a sweet baby teething toy that I would share it with you in case you want to make one for your own baby or as a shower gift. Step 1: Figure out how big you want your sun to be. I chose a plate to trace for my circle. 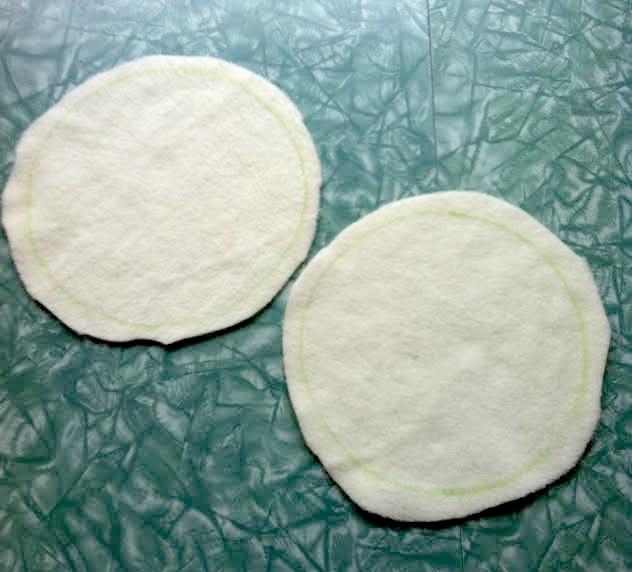 Trace two circles on your yellow felt. 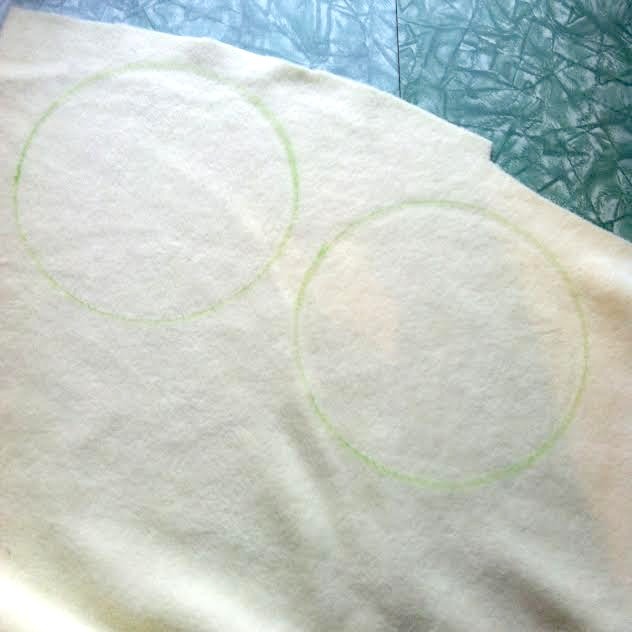 Step 2: Cut out your fabric circles leaving approximately a 1/2 inch border between the circle that you traced and where you are cutting. 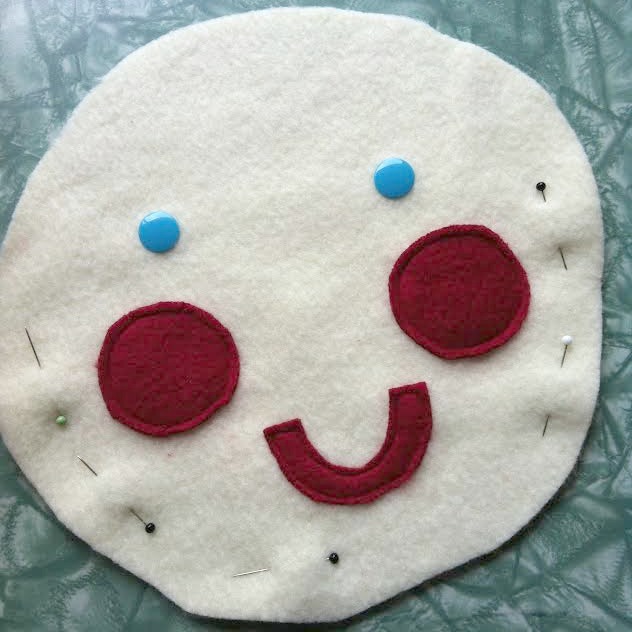 Step 3: Cut out a mouth and circles for the cheeks from red felt. (If you are making felt eyes do them at this point too). 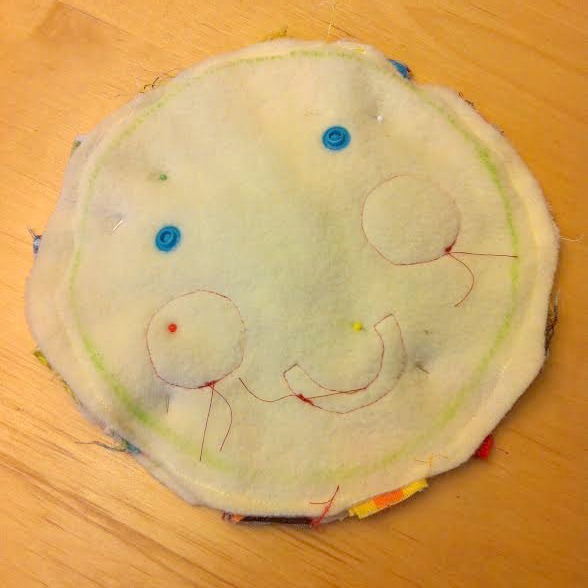 I put pins into the fabric where my traced circle was on the back of the fabric so that I could properly center the sun’s face. Sew on the cheeks and mouth and attach the eyes. Step 4: On a piece of paper draw a sun ray to use as a template. Make sure that your ray is a bit wider and longer than how you will want it to allow for a seam allowance. 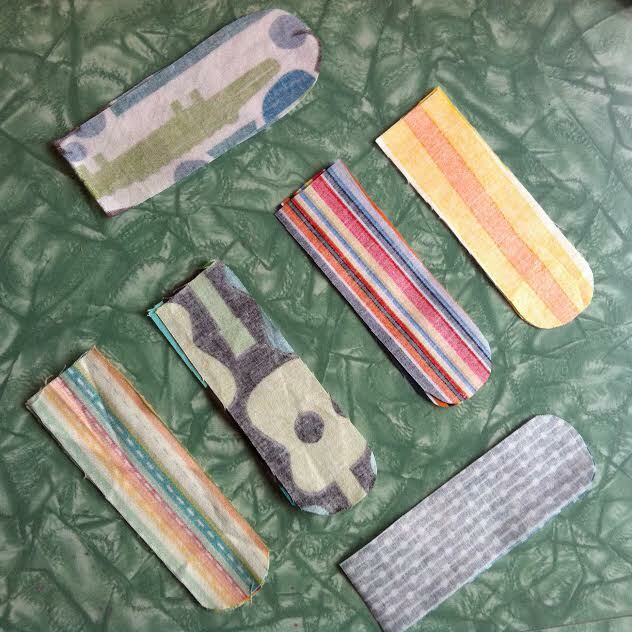 Cut the rays out of your fabric scraps. Place the rays so that the fabric is right side together. Using a 1/4 inch seam allowance sew up one side of the ray, around the rounded part and down the other side. Do not sew the bottom of the ray. Turn rays right side out and press with an iron. For my project I used 13 rays. You can use more or less depending on the size of your sun, how big your rays are and how close or far away you want each ray from each other. Step 5: Evenly space the rays around the perimeter of the sun and pin into place. This should be done on the side of the sun with the face with the rounded edges of the rays pointing towards the center of the sun (as pictured above). Step 6: Using your sewing machine baste the rays into place roughly half way between the edge of your fabric and where the circle that you drew on the back of your fabric is. 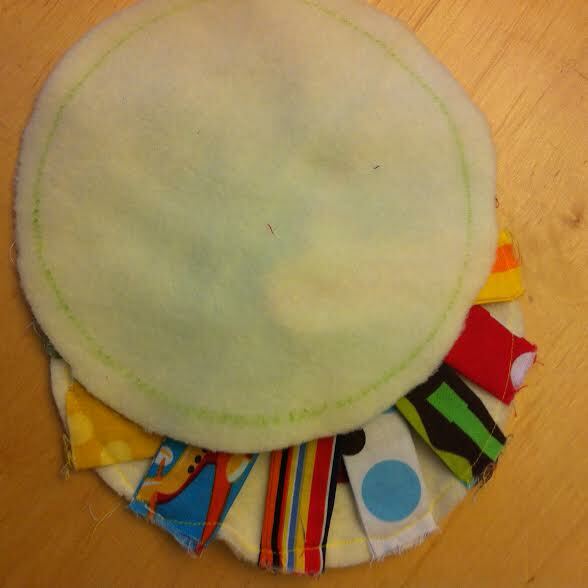 Step 7: Place your second felt circle on top of your circle with the rays attached, sandwiching the rays and the face in the middle. Pin into place and sew around your traced circle leaving a 2 inch opening so that you can turn your sun right side out. Backstitch at the beginning and end of your sewing. Step 8: You will be left with something that looks like this. Trim your threads, remove your pins and flip your sun right side out. The easies way to do this is to pull one of the sun’s rays through the gap that you left open and gently pull it through to the outside. Step 9: Fill your sun with cotton batting and hand sew the opening closed using coordinating thread. Iron the rays of the sun if needed. 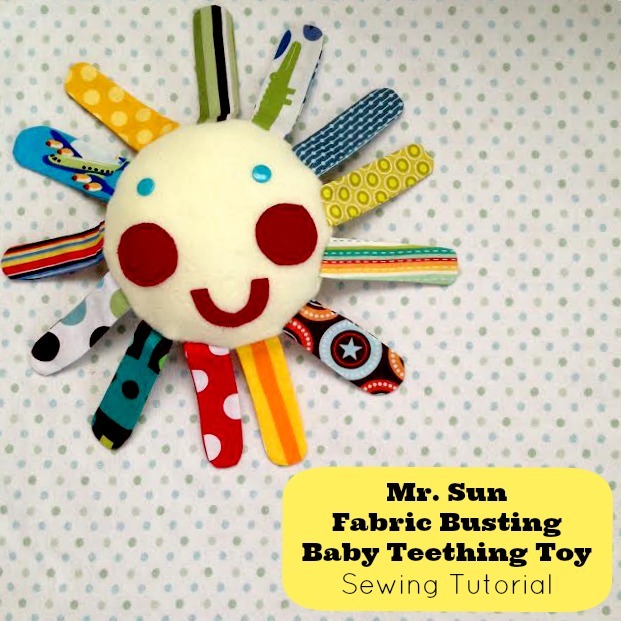 I hope that you enjoyed our Mr. Sun Fabric Busting Baby Teething Toy Sewing Tutorial. 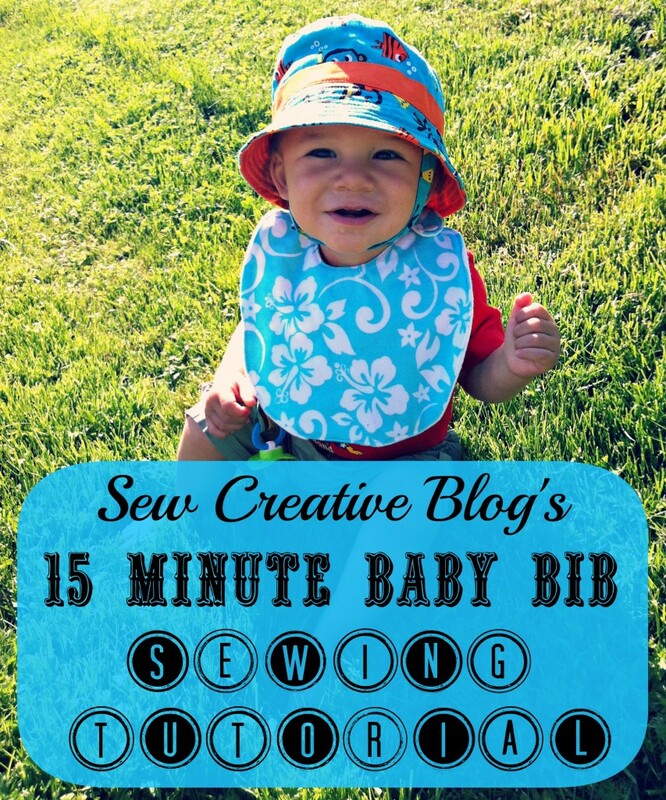 If you are looking for another fabulous handmade baby gift check out our 15 Minute Baby Bib Sewing Tutorial. Like what you see on Sew Creative? Commenting on our posts, pinning our recipes and craft projects, following us on Pinterest, Twitter, Facebook and subscribing (in the box in the side bar towards the top in the right hand column) mean a lot to us. Tell me… Do you have a “Go To Gift” for baby showers? What is the favorite baby gift that you ever gave (or received)? Do you like to give handmade gifts? 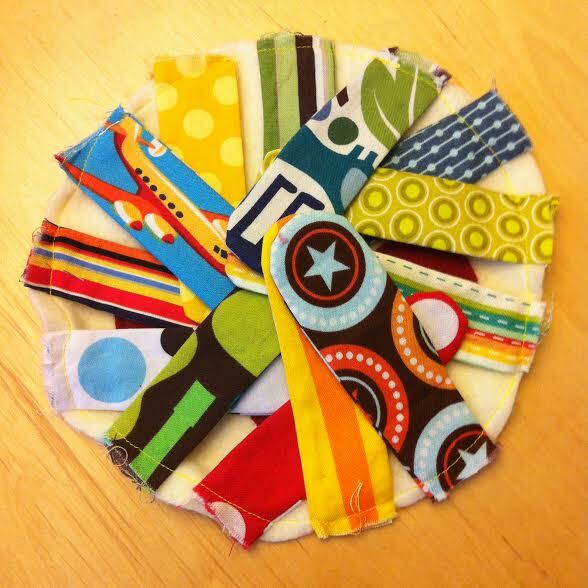 If you’ve ever given a handmade baby gift we’d love to hear about it! I have some plastic tongue depressors. These could be cut in half with a hack saw, and put into the rays to give them more “bite”. Wood ones probably wouldn’t be safe because they crack and splinter. Very cute idea! Super easy to make, perfect gift idea! I love baby toys. These would make great baby shower gifts, and your tutorial makes it look easy to do. Thanks for sharing!! Thank you so much Michelle! It was a pretty fun project to make. 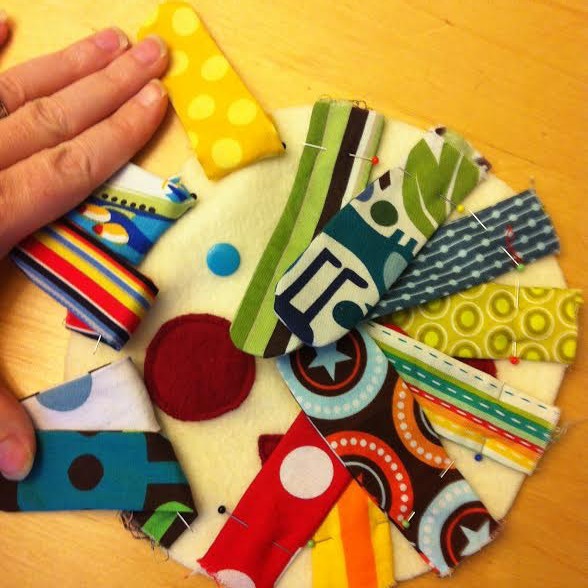 It could have so many different looks depending on what fabric scraps you use. If you make one I’d love to see it. Interesting idea,The pictures look nice. Wow ,Crystal, what a name “Mr Sun Fabric Busting Baby Teething Toy”. Colors are amazing and looks like a fun project to do. Tfs! This is a great idea! We can make easily and these colorful fabrics are attracting kids.